Head coach Slava Koulikov insists Phantoms must forget about their aggregate advantage as they attempt to reach the NIHL Autumn Cup final. The city side travel to Swindon tomorrow (Friday, 7.30pm) for a semi-final, second leg in possession of a 4-3 lead. But Koulikov is adamant that victory on home ice last Friday in the reverse fixture is no longer of relevance. The 60 minutes – or possibly more – of hockey in Wiltshire are what matter now. Koulikov said: “We cannot think about trying to defend a lead on aggregate. It is the wrong mentality to have. “Swindon are the best team in the league by far and we produced one of the best performances I’ve seen from my guys to beat them in our rink. “Guys put their bodies on the line all over the ice and there was not a single poor performance out there, but now it is a new day and a new game which starts at 0-0. “I’m sure Swindon will think they can turn it around on home ice, but there is more pressure on them as well. That will only build as the game goes on if it doesn’t go the way they want or expect. The first-leg triumph against Swindon stretched Phantoms’ terrific winning streak into double figures. They followed it up with a smooth 3-1 league success against Basingstoke last Sunday to make it 11 consecutive victories. 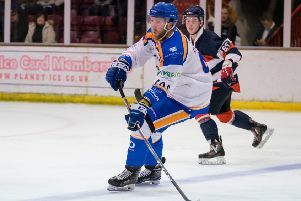 They’re now likely to face their toughest test yet tomorrow night before shifting their focus to another crunch clash on Sunday when they entertain table-topping Bracknell in an NIHL Division One South fixture at Planet Ice (5.30pm). Koulikov added: “Our focus has always been on one game at a time and right now the second leg of the cup is our priority. “We cannot and will not start to think about Bracknell until after we have faced Swindon. “We also have other big games coming up. We face Streatham and Swindon in the league the following weekend and it would be easy to make the mistake of looking too far in advance.